The card from her mom said "for all the people who said your degree won't keep you warm, now it will.'" Maybe you've heard the phrase, "that degree isn't gonna keep you warm" before. It's a knock at students scrapping for an education and supposedly missing out on other things. Now, one North Carolina graduate can now laugh at that phrase. She can take her diploma and literally snuggle with it. Kynnith Francis just got her master's degree from University of North Carolina-Greensboro. She finished with a 4.0 and landed a job before graduation. She said sometimes all the hard work made personal relationships difficult. "I [told] my mother sometimes I feel that it's hard to be in a relationship with people because I'm so focused on school. A friend of mine [said], 'that degree isn't gonna keep you warm at night. A man will.'" That was a year and a half ago. Today, Francis works in student affairs at the University of West Georgia. When she moved into her new home, she found a surprise lying on the bed. It's a blanket. But it doesn't have colors or patterns. It boasts her master's degree. "I roll it out and I'm literally in shock," Francis said. "This is my degree on a blanket. How did she make this happen?" The "she" Francis is referring to is her mother. She remembered the conversation with her daughter about the struggles of school, and what her friend said. Her mom responded with a gift. A way for her daughter to always stay warm with the help of her degree. "The card said 'for all the people who said your degree won't keep you warm, now it will.'" Francis says she's amazed her mom remembered the brief conversation. "Wow, she really remembered me saying that maybe a year and a half ago. And now my degree really is going to keep me warm, and there's nothing anyone can say about it." 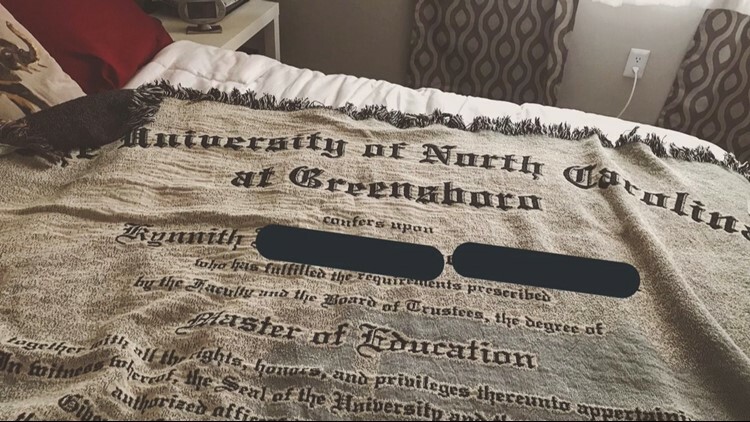 Folks on Twitter had plenty to say about the degree turned blanket. All positive things. As of Wednesday morning, Francis' picture has more than 45,000 retweets and 165,000 likes.